Recently on 11th Jan 22019, an agreement for the construction of Renukaji Dam Multi-Purpose Project was signed by six states namely Haryana, Himachal Pradesh, Uttarakhand, Delhi, Rajasthan and Uttar Pradesh in the presence of Union Water Resources Minister Nitin Gadkari. Along with the Renukaji dam multipurpose project other two projects are planned in the Yamuna river basin, Lakhwar Project on the River Yamuna in Uttarakhand, Kisau Project on the River Tons in Uttarakhand and Himachal for the effective utilisation of the water resource. Renukaji Dam Multi-Purpose Project is a storage project on the Giri river which is tributary of the Yamuna at Sirmour district of Himachal. A 148 m-high rock-filled dam would be constructed across the river Giri. 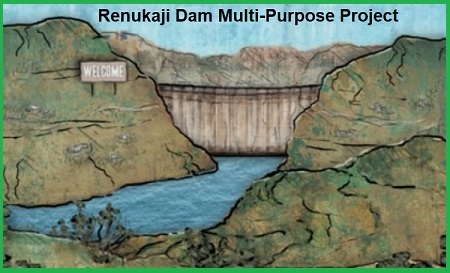 Renukaji Dam Multi-Purpose Project also involves the generation of 40 MW of power during peak flow to be executed by Himachal Pradesh Power Corporation Ltd (HPPCL). Renukaji Dam Multi-Purpose Project would increase by the river flow about 110 percent which will be used to meet the drinking water needs of Delhi and the other Yamuna basin states up to some extent in the lean period. Under Renukaji Dam Multi-Purpose Project, the share of stored water among the states will be as follows, Haryana-47.8 percent; Uttar Pradesh/ Uttarakhand-33.65 percent; Himachal-3.15 percent; Rajasthan-9.3 percent and NCT of Delhi: 6.04 percent. The Central government will also bear 90 percent of the cost of irrigation/drinking water component, and the balance cost will be borne by the states.